Shirts With Random Triangles: Bill Cubit Is An Ex-Illinois Head Football Coach. Bill Cubit. Image via The Chicago Tribune. 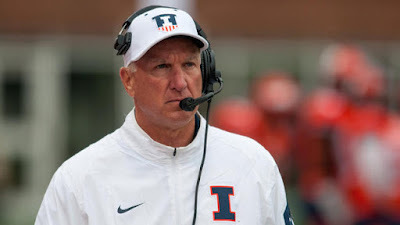 Bill Cubit is an ex-Illinois head coach. Newly installed Illinois athletic director Josh Whitman announced Cubit's dismissal in a press release from the school Saturday morning. "I appreciate the leadership that Bill Cubit provided our football program during what has been, unquestionably, a very tumultuous time," Whitman said. "He accepted the challenge on an interim basis under incredibly difficult and unusual circumstances, and he has continued to work diligently for the betterment of our student-athletes. Through his efforts, he has kept the program moving forward. Bill is a good man and a good football coach. All of us in the Illini Nation owe him a debt of gratitude for his work leading our team these last months. At this juncture, however, I think it is most important that we position our program for long-term success by creating a more stable environment for the coaches, players, and prospective student-athletes." Cubit became interim head coach of Illinois following the firing of Tim Beckman just before the start of the 2015 season. The Fighting Illini went 5-7 under Cubit.